All fairandfunky workshops encourage participants to look at the world around them and empower people of all ages with the knowledge that their actions can have a positive impact on the world around them; both locally and globally. 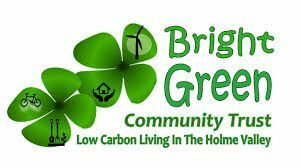 Thanks to funding from The Bright Green Community Trust (One Community Foundation) we have developed a special ‘Let’s Go Green’ workshop to share some of the ways in which we can all take little steps to change the world. And this week we’ve been to Hepworth J&I School and Holmfirth (NABB) J&I School to launch the project. 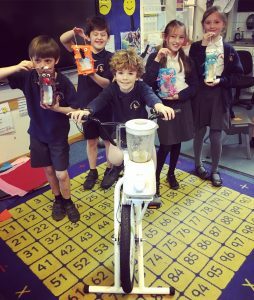 Using a smoothie bike to connect sustainability issues together the students explore where food is from, discover the importance of Fairtrade for farmers and make a bird or bird feeder from the old milk and juice cartons to kickstart conversations about what we do with our waste; all whilst making a delicious Fairtrade banana smoothie! “This workshop was brilliant for our students and connected with our topic of healthy eating, healthy bodies and healthy planet. We do all need to take steps to look after ourselves and our planet, this workshop set out the steps perfectly for our children.” Mrs Hinchliffe, Year 3 teacher at Hepworth Junior School. Through insightful questioning the children began to think about how we are all connected; people and planet. The things we use, and eat everyday are made by somebody somewhere. The Year 5 children shared their responses to encourage each other to make ethical choices to go green in our daily lives and take little steps to change the world. Why does growing your own food make a difference to our planet? We can’t grow our own bananas! How can we make a difference to our planet when we do go shopping? When you get home from the supermarket and unpack your shopping, what do you do with all the packaging? By thinking about where our rubbish goes, and what we do with it we’re starting to make a difference to our local and global environments. When you throw something away – stop, and think – can this be recycled? Can this be reused? When you buy something new – is it recycled? Am I living sustainably? Am I taking little steps to change the world? 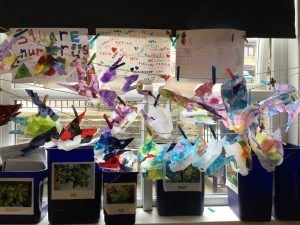 Many things we throw away can actually be re-used and made into something new: “Don’t throw it away…… make something!” And each student created a bird or bird feeder from the old drinks cartons, to fly home, and spread the message to RE-think, RE-duce, RE-cycle. “Fantastic information shared with pupils who were engaged and inspired to make small changes. It has given pupils ideas for clubs they can run to inform younger pupils. All the pupils had a fun filled, informative hour – thank you!” Mrs Perrons, Year 5 teacher at Holmfirth J&I School. Thank you to Bright Green Community Trust (One Community Foundation) for funding the project. We’re thrilled to be able to bring this workshop to schools across the Holme Valley and empower young people to take little steps to change the world and look forward to working with Upperthong J&I School, Hade Edge School, Netherthong J&I School, Wooldale Junior School and Holme J&I School over the next few weeks!